It was a sea of red today, with broad based losses in stock markets across the board as trade war tensions mounted, with the announcement from Harley Davidson that it was relocating manufacturing to Europe to offset tariffs. The declines began in Asia, accelerated in Europe and then the US followed, with the indices down the most in the first half of the session, after which a recovery off the lows followed. Commodities came under pressure with oil managing to hold onto the gains from Friday, while bonds rallied and the VIX jumped 25% to 17. The Dow fell 1.33%, while the S&P 500 was down 1.37% and the Nasdaq fell 2.09%, with the tech sector selling off on fears that the White House would ramp up pressure on China. The small-to-mid cap and more domestically focused Russell 2000 index declined 1.67%, while the trade-sensitive Dow Transports slipped 2.34%. The S&P500 at one point touched 2700, but support came in to mitigate losses on the day. As long as the S&P500 holds above this support level, the balance of probability lays to the upside. Sentiment is fragile globally and becoming increasingly so in the US, but the reporting season should deliver strong earnings numbers in a few week times. This will provide significant valuation support for the US market near term. 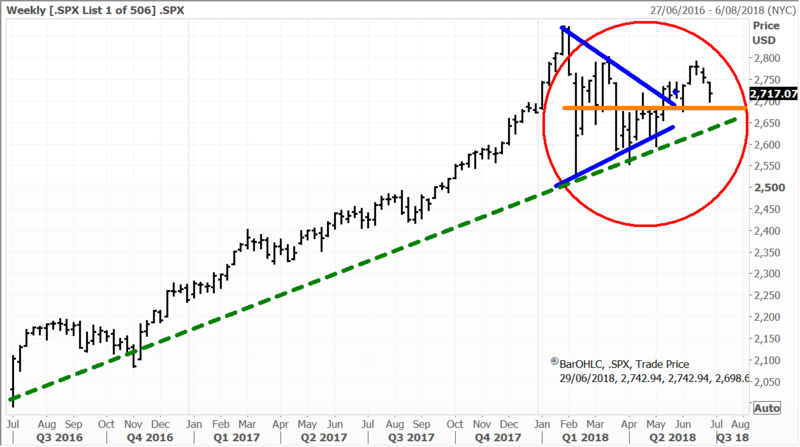 However, we need to brace for what will likely be strong warnings from the corporate sector to the US Government about the dangers growing trade spat with China and Europe. The technology sector was pressured by a Wall Street Journal article reporting that President Trump plans to limit Chinese investment in US technology, in the latest round of ramping up trade tensions. US-listed shares of Chinese online search giant Baidu fell 3.3%. Disney is reportedly feeling the heat from some Star Wars fans who feel the company mishandled the franchise with the relatively disappointing release of the Solo origin movie. The stock declined 1.6% on Monday. We view this as noise, the Star Wars franchise is a strong one that has stood the test of time, and Disney should do better with the next movie. Sharp Corporation slumped 5.1% after saying it will issue new shares. Defensive shares were out of favour, with railroad stocks closing lower and large caps Fast Retailing (behind the Uniqlo brand, -1%) and Softbank (-2.4%) also weighed on the index. Energy names fared relatively well after oil producing nations agreed to only a modest increase in production last week. Local energy giant Inpex Corp rose 1.8%. Touch screen technology leader Nissha Co advanced 1%, as did silicon maker Sumitomo Chemical. Technology names in Hong Kong fell on weak sentiment given the latest news from the Trump camp, with lens maker Sunny Optical slumping 4.9% and local social media giant Tencent Holdings declined 2.2%. The Macau casino operators also had a tough day, with Sands China, MGM China and Wynn Macau falling 1.7% to 4.3% despite bullish reports from brokers. As in Japan, energy-linked stocks gained, with oil and gas super major CNOOC up 2.4%. After a promising start to the session, with fresh decade highs, the Australian market finished lower on Monday. The ASX200 gave up 14 points to close at 6,210. The banks were lower, with CBA leading the falls, down 2.3% after it announced plans to demerge. The energy sector and resource stocks were in demand as expected with gains of 1.4% to 2% for BHP, Woodside and Oil Search. With trade war concerns dominating overnight today is set to be more volatile – the SPI futures are pointing to a 1% decline on the open. With the current console generation beginning to be a little long in the tooth, Sony is looking to software and subscriptions to drive revenue in its PlayStation division. In the United States, PlayStation hits are going on special for US$19.99 a pop. The selection includes a bunch of PlayStation exclusives such as the Yakuza series and Uncharted 4 and some other big names that are cross platform like Battlefield 4. The promotion will kick off in the United States with 15 games and in Canada with 14 titles. There will also be differentiated packaging. Sony’s Game and Network Services (G&NS) segment has been Sony’s star performer in recent years, with the PlayStation 4 (PS4) posting strong sales since its release, easily outpacing Microsoft’s Xbox One. PS4 unit sales have hit 79 million and the PlayStation Plus subscription service has more than 34 million customers, while the PlayStation network has 80 million monthly active users. With a shifting model to more digital and content-driven sales rather than a reliance on hardware, this bodes well for Sony’s gaming business going forward. Separately Sony is launching a direct-to-consumer video service in Western Europe for the first time. Film1, an existing Sony Pictures Television Networks brand will be a standalone streaming service available in the Netherlands for €7.99 a month, or €79.99 a year. Netflix doesn’t have much to worry about on this front at the moment though with Sony’s service reportedly only offering about 300 movies on-demand at launch. Disney will be a more serious competitor when it launches its service next year. With Disney classics, Marvel, Pixar and Star Wars IP the offering should draw in many subscribers. The combination of Fox’s media assets would further bolster its offering, but even if that doesn’t pan out for Disney, the service will attract many families. 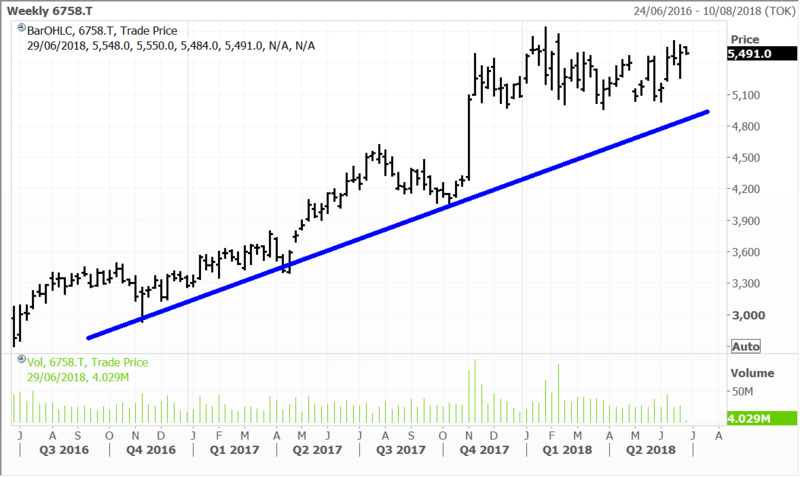 Disclosure: The Fat Prophets Global Contrarian Fund declares a holding in: Baidu, Disney, Inpex Corp, Nissha Co, Sumitomo Chemical, Sunny Optical, Sands China, MGM China, Wynn Macau, CNOOC, BHP and Sony.